Grand Opening — Saturday, September 24! 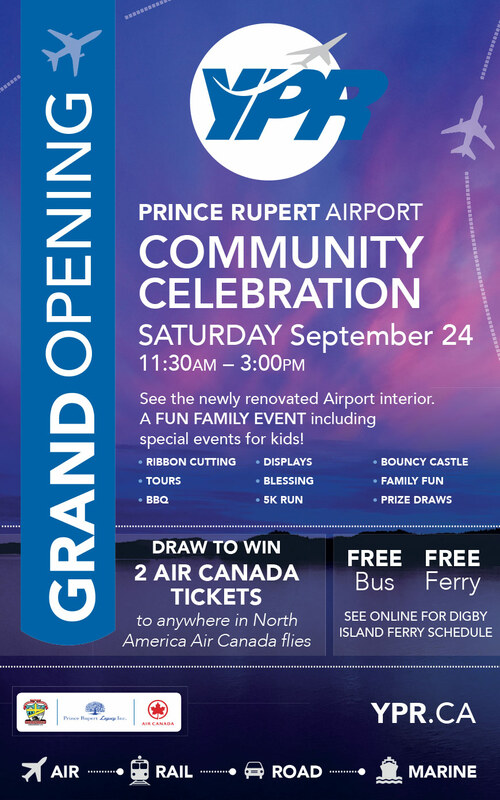 The Prince Rupert Airport authority is hosting a community celebration and open house this Saturday, September 24th from 11:30AM to 3:00PM. All comers are invited to see our newly renovated Airport interior. This will be a fun family event with special events for kids as well as a draw for your chance to win two complimentary Air Canada tickets! Please be ready to board 10 minutes prior to scheduled departure time. For Digby Island Shuttle Service information call 250-600-3276.